Synergy Associates was established in 1999 to conduct research and provide consulting services in governance, management, leadership, board and director evaluation, organizational development and strategic planning. Synergy Associates, headquartered in Ottawa, has a network of seasoned consultants in Ontario and Western Canada. Mel Gill, B.A., MSW, is President of Synergy Associates, Consultants in Governance and Organizational Development. He is the author of the widely acclaimed best-selling book, Governing for Results: A Director’s Guide to Good Governance; the ‘Governance Self-Assessment Checklist’, a research-validated diagnostic, educational and strategic planning tool for boards; the ‘Board Culture Checklist’, all designed to assist boards in evaluating and improving their governance practices; Pour une gouvernance qui obtient des résultats : Rôles, responsabilités et relations du conseil d’administration; and, several published articles on nonprofit, corporate and network governance, organizational effectiveness as well as development of public policy. (See Publications) (See What Others Have Said). He is respected as an innovative thinker and a leading authority on nonprofit and public sector management, governance and organizational effectiveness. He brings perspectives from his studies in law, social work, psychology, political science and economics; experience as a senior manager in government; program, policy and budgeting analyst with the Saskatchewan Treasury Board; internal Treasury Board consultant responsible for implementation of a Program-Based Management Information System in several government departments; development of standards for management and funding of community services and employment grants to nonprofits and small businesses; CEO of one of the largest nonprofit social service agencies in Canada; and as a volunteer board member (executive and founding) with a score of local, provincial and national nonprofit boards. He was awarded grants from the PricewaterhouseCoopers Endowment for the Business of Government and several federal government departments between 1999 and 2002 to support his research on governance in nonprofit and public sector organizations. Mel has received several honors for leadership in mental health services and children’s services. 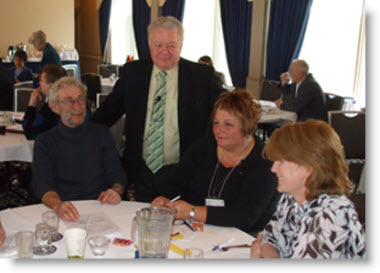 Mel has been an advisor to United Way Canada on redesign of its board development curriculum and United Way International on the development of ‘Global Standards’ for ‘Governance, Privacy and Ethics’. He was a Senior Associate of the Institute On Governance in Ottawa from 1999 to 2004. He has been on faculty with the ‘Fundamentals of Governance’ course offered by Queen’s University, School of Business, Executive Development Program and the Directors’ Education and Accreditation Program and Nonprofit Governance courses offered by the Institute of Chartered Secretaries of Canada (ICSA). He has also been a sessional lecturer in a number of university courses on the politics of change; health care, nonprofit and public sector governance. Mel has been consulting, conducting research, writing, training and speaking on governance best practices and organizational effectiveness since 1999. During this time he has conducted governance audits, board/director evaluations, strategic planning and training and development of bylaws and governance policies with more than one hundred non-profit, public and private sector agencies, associations and corporations. All boards have the knowledge and skills necessary to effectively govern and enhance the effectiveness of the organizations entrusted to their stewardship. Synergy provides board leaders with information, tools, advice and assistance necessary to effectively fulfill their governance responsibilities and enhance their performance.  We will work closely with you to ensure that your needs are understood and met.we will consult key players so that their views are understood and respected and will strive to optimize the prospect of 'buy-in' among key stakeholders.  We will bring our experience and knowledge to the assignment without imposing our own assumptions.  We will provide you with advice in a way that makes strategic sense to you and other key stakeholders.  We will apply the highest level of methodological rigour so that the end product stands up to objective review.  We will add value to your organization and its purpose.  We will ensure that our work is "user-friendly" so that when our work is complete, you are fully able to implement and build upon our work.  We will pride ourselves on delivering an excellent product that will ensure it serves truly useful strategic and operational purposes that support the aims and mission of your organization. Police Services Board, Port Moody, B.C. Prairie Valley School Division, Regina, Sask.